This is part of my Cheng Pei-pei review series. You can see my other reviews of her movies here: Come Drink With Me, Golden Swallow, Brothers Five,The Lady Hermit,The Shadow Whip, and Dragon Swamp. The Golden Sword was released in 1969 by Shaw Brothers Studio and directed by Lo Wei. It stars Cheng Pei-pei (Jin-Feng), Kao Yuen (Bai Yu-Lung), Wang Lai (Lung Xin-Zi), Lo Wie (Bai Chun-Tung) and Wong Chung-Shun (Saintly Swordsman Luke). Action direction by Sammo Hung and Simon Chui Yee-Ang. I saw The Golden Sword for the first time right before doing this review and I think it might just possibly be my favorite Cheng Pei-pei. At the very least The Golden Sword sits right beside Lady Hermit and Come Drink With Me. It has also greatly added to my admiration for Low Wei as a director, who also directed The Shadow Whip and Dragon Swamp. Like those movies movies The Golden Sword puts much of its focus on story and has an adventurous quality. Lo Wei seems to make good use of Cheng Pei-pei's talents beyond wielding a sword. For example we are treated to her singing and dancing skills during a music number at the Beggar Sect camp. In Golden Sword Lo Wei also delivers romance, secret societies and a vast span of landscapes. It is a film where you get to witness characters develop over years. There is a mystery at the heart of the Golden Sword, and from the very first scene I was intrigued by it, finding myself eager to know the contents of a mysterious box delivered to a great master. The mystery only deepened and the box once open led to more questions I wanted answered. But following the characters over their years long journey through, the answer was worth being patient for. The film opens at the Golden Sword Lodge on a stormy night, where two mysterious masked riders approach and demand to see Chief Bai Chun-Tung. When the Chief's men ask for further information, they are simply given a small box and told that Chief Bai will know who they are. With a foreboding look, he walks outside and and joins the riders, saying to his men "don't wait for me" as they take him away. Seven years later we are at a meeting of the 36 schools and they are about to elect Chief Ng as his successor after seven years of fruitless searching for their lost master Bai. Chief Ng promises to honor the memory of Chief Bai when his son, Bai Yu-Lung requests permission to go search for his father for three years. The Chief admires Yu-lung's dutifulness toward his father and grants permission. Yu-lung travels west, beyond the frontier and into a small mountain community where corruption reigns. By this time he has already been on the road for two years. He meets a young beggar named Jin-Feng who he mistakes for a young boy. Like many movies in this genre, simply donning a cap and wearing plain clothes is enough for women to pass as men. Worried for her safety, he gives Jin-Feng some food and later invites her to his room. Concerned about decorum, Jin-Feng is reluctant but eventually sleeps on the floor and evades joining him in the bed by claiming to have lice. That night a gang of thugs led by a man named Black Demon, accuse Bai of stealing silver they were going to transport for a trio of men called The Three Cripples. Black Demon works for Chief Yao, who regularly transports money for corrupt officials in the region. As a fight break out, Jin-Feng reveals she was the thief, and then massacres the Three Cripples. She leaves saying if Chief Yao wants to confront her about the silver he can meet her at Happy Pass. Bai asks the innkeeper where this Happy Pass is, and he says it can be anywhere, as it is the camp of the Beggar Sect. Jin-Feng goes back to Happy Pass and joins her fellow beggars at their camp. It seems she is the daughter of the leader, Beggar Chief An (though this might not be an actual blood relationship, it is unclear from the subtitles). Jin-Feng changes into female attire and tells Beggar Chief's wife that she is expecting a visitor. Bai arrives shortly after and they throw a celebration for him, complete with a full musical number. Chief Yao arrives in the camp the next day, demanding his silver, and Beggar Chief An playfully refuses, claiming he has spent all the money so there is nothing left to give him. Jin-Feng tells the chief that if he wants his silver, she is the one who took it. 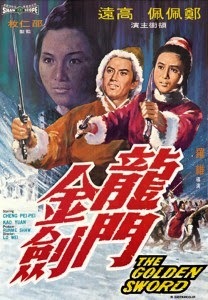 They fight and she kills him, quite brutally, leading to a battle between beggar sect and Chief Yao's men. The beggars easily defeat the chief's forces and after, as Bai is about to depart to continue his search for his father, Jin-Feng offers to go with him. They spend the next year searching together but fail to find Bai's father. Returning to the Golden Swords, Bai and Jin-Feng marry, attended by Chief Ng, Beggar Chief, and Keeper Pang, as well as numerous other guests. The next morning a mysterious iron box arrives as a wedding gift. Too heavy to lift, when they open it, it reveals a smaller box inside, followed by another, then another. The final box contains the Golden Sword of Bai's father. As soon as the sword is revealed two masked riders reach the lodge and demand Bai come with them. Bai, Jin-Feng and the rest of the wedding guests try to fight off the riders but their martial skills are too great and they take Bai with them (though not without losing a horse). When Keeper Pang inspects the horse's body he finds an emblem and tells the others it is the seal of Dragon Palace, a place people have only heard whispers about. Pang informs them that Dragon Palace is real and to be feared. In a major twist, he removes his face, which was just a mask, and the others recognize him as a man who disappeared thirty years ago called Saintly Swordsman Luke. According to Swordsman Luke he was trapped in the Palace but escaped, meeting Bai's father in the process, and both changed their identities. Jin-Feng convinces Swordsman Luke to take her to the palace to rescue Bai. On their way they find Red Leaf Valley, Swordsman Luke tells Jin-Feng the tale of his journey to Dragon Palace to learn their superior techniques, that they have severe laws and are ruled by women. After fighting their 7th Lady in Red Leaf Valley, Luke was sentenced to a lifetime of labor at the palace for trespassing. Bai's father was just a cowherd who saved found a young woman poisoned by a snake. He sucked the venom from her wound and as a reward she took him back to the Palace, taught him her techniques and married him. 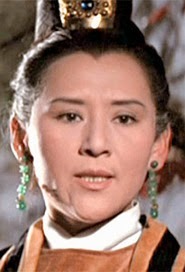 She was also the master of Dragon Palace: Lung Xin-Zi. However Dragon Palace has a strict rule that all first born males be killed. So Bai's father took his son and fled, meeting Luke and helping him in his escape. After telling her his story, a strange mood descends on the Red Leaf Valley and Luke panics, flashing back to his time in hard labor. He flees and Jin-Feng vows to find Bai on her own. Eventually she finds a lady of the palace who offers to help, but informs her that Bai has already left. As Jin-Feng and Luke were trying to rescue Bai, he had already made his escape and found his way back to the lodge. There he finds everyone has been paralyzed so releases their pressure points to learn that they are under threat from Dragon Palace. A woman called the Executor arrives and her lackeys bring in Saintly Swordsman Luke. She plans to kill him but Bai obstructs her, finding himself on the receiving end of powerful internal energy techniques. A masked woman in black swoops in and rescues Bai, taking him back to Red Leaf Valley to reunite with Jin-Feng. His rescuer is Lung Xin-Zi, who is trying to protect her son, but says according to Dragon Palace law, even the Master must abide by their rules, so she can't do so openly. She tells Bai that his father is alive and was sentenced to 10 years labor, which has almost elapsed. She blesses the marriage and promises to abolish the laws that have torn their family apart. At a dramatic ceremony she says she wants the laws abolished and asks the executor to inform the sect how that can be done. Pointing to a massive rock with the laws engraved on it, the executioner tells the women of Dragon Palace that the the laws can only be abolished by the blood of the master. They plead with their leader not to sacrifice herself, but she stands atop the rock and strikes own chest, releasing a flow of blood onto the stone inscription. The next scene is Bai, his father and Jin-Feng walking up the steps to the rock to pay their respects to Lung Xin-Zi's memory. The Swordplay is all very good but this isn't a wuxia film that is only about the fights (again, Sammo Hung was one of the action directors). There is a dense and epic story here, and that is what matters more than the fighting. Still it has some truly great scenes in this department. There is a playful exchange when Bai first goes to the tavern in the mountain village, where he fends off his attackers with chop sticks as they try to take his roasted chicken. Cheng Pei-pei's fight with the Three Cripples ends suddenly with their deaths, and this works well. You are expecting a longer fight but she beats them in under ten moves. 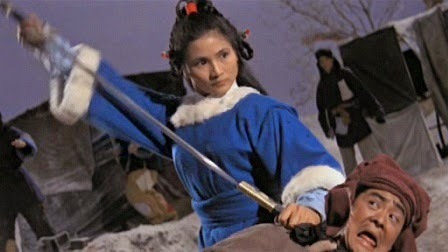 In most of Cheng Pei-pei's swordplay scenes she easily outmaneuvers her foes and delivers stunningly lethal strikes. Her battle with Chief Yao is particularly gruesome and stark in this regard. Notably, she goes to rescue Bai from the Dragon Palace, not the reverse. And he is ultimately saved by his mother, rather than his father. More than the swordplay, it is the mystery of Dragon Palace that drives Golden Sword. And it is a deep riddle. This secret and widely feared organization is led by women and enforces its laws with great cruelty. In Dragon Swamp, Lo Wei also had a secret society of female warriors, but that one was a force for good. This is the inverse, with a society of women who punish men and live by a code that demands blood. One thing I really liked about the Golden Sword is the wide variety of settings. It isn't a martial arts movie that hangs out at the same villa for two hours. We go from villa to wilderness, to snowy village, to beggar camp, to many places along the red before reaching Red Leaf Valley and Dragon Palace itself. It coursed over these environments like a tour. For gamers I think I'd recommend this over all the other Cheng Pei-pei movies. There is just too much here to pull for a game. I found myself taking notes to use for future sessions as I watched. You could easily take this movie and turn it into three or four adventures. The trailer below gives a good idea of the kind of swordplay and story to expect.